In 1982 George Lucas decided that a Jedi would not seek revenge and altered the unreleased film title to ‘Return of the Jedi’, although later (or earlier?) the Sith would have revenge! 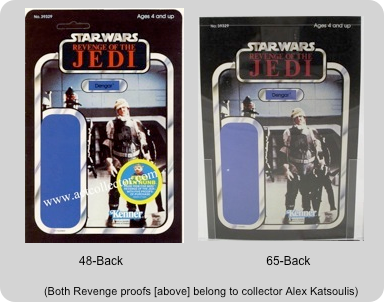 The leadtime for toy production was considerable, and a large amount of ‘Revenge’ packaging had already been produced in proof card format, and various mockups had been created when the Revenge name was shelved. In addition to Revenge proof cards and mockups, a number of vehicle proofs and even boxflats which closely resemble the finished article. Revenge of the Jedi proof cards exist in two forms. Firstly, the ‘common’ 48-back proof with ‘Free Nein Nunb’ offer (inset right), an example of which can be found for each of the 48 Empire Strikes Back released figures, plus a ‘template’ proof and an R2-D2 with various parts not printed – 50 proofs in total. A number of complete sets of all 50 ‘common’ Revenge proofs have been put together. Most of the 48-bk proofs appear to be available in roughly equal numbers, although the popular characters fetch more money while the ‘template’ proof and Rebel Commander are possibly slightly rarer. A number of Revenge of the Jedi vehicle box proofs exist, some examples of which can be seen in the ‘Vehicle Proofs and Cromalins’ section of this website. Many collectors make their first foray into proof card collecting by gathering a selection of 48bk Revenge of the Jedi proofs. These are the most commonly available proofs, and have the added cachet of being unproduced items. Some collectors perhaps gather a ‘set’ of the 12bk character on Revenge cards, maybe the bounty hunters, hoth characters or whatever else floats their boat. Of course some dedicated collectors will try and gather a full set of all 50 Revenge of the Jedi 48bks (all 48, plus the ‘template’ and ‘blank’ R2-D2 proof). In terms of rarity, a few of the Revenge proofs appear to exist in smaller numbers than the others, while other popular characters are sought after by collectors and therefore become artificially rare.